When a CD is accompanied by a booklet containing a lengthy, meticulously detailed story to serve as a mere introduction to the whopping, 68-minute album, you can just hear the groans coming from those with little to no patience for fantasy/power metal. Admittedly, those bands tend to take their storytelling a bit too seriously, and few will ever come close to matching the epic scale of something like Blind Guardian's Nightfall in Middle-Earth, but for every disappointment (Angra, Rhapsody of Fire), we get a very pleasant surprise. Like their horribly named peers Fairyland, France's Anthropia offer a rather fresh take on a stale sound; largely a one-man project featuring a mysterious dude named Hugo (who plays every instrument except drums), bombastic melodies are offset by plenty of robust musicianship, hearkening back to the days of power metal's mid-'80s infancy, when Helloween and solo King Diamond dominated the form. Instead of flitting lead guitars and operatic wails, we're treated to more brooding guitar tones and plenty of downright shocking musical turns, be it some Queen-style choral vocals, acoustic folk moments, bass tangents that resemble King Crimson, jazz piano interludes, and even some old fashioned '70s progressive rock. 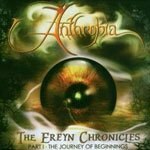 A title like The Ereyn Chronicles, Part I: The Journey of Beginnings is enough to send people sprinting in the opposite direction, but it pleases this writer to say that it's a very welcome, not to mention fun respite from the usual one-dimensional power metal buffoonery we're normally subjected to.